When someone is first diagnosed with incontinence they can often feel overwhelmed and overcome with embarrassment. Many people feel that they will no longer be able to carry on with their daily activities. They may worry that the embarrassment that can be caused by incontinence accidents will leave them homebound and alone. The good news is that there are many different adult incontinence products that are available that can help you to manage your own incontinence or that of the loved one in your care. Incontinence bed pads can are an important incontinence management tool that can be used in conjunction with incontinence underwear and other adult incontinence products. Incontinence bed pads should not be confused with incontinence pads. Incontinence bed pads are used to protect bed, bedding, and furniture from the damage that can be done by incontinence leakage and accidents. 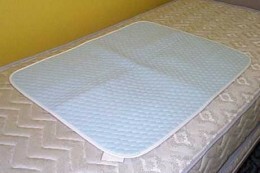 Incontinence bed pads can also be taken on the go and used to protect wheelchairs, car seats, and any other place that the person with incontinence may be sitting or laying down on. Many people with incontinence like to have a pile of incontinence bed pads handy so that one can be spread out underneath the person with incontinence wherever they are. It is important to stress the incontinence bed pad should not be used in lieu of an incontinence undergarment or incontinence pad. The person with incontinence should wear the appropriate incontinence undergarment (either with or without an incontinence pad), in order to have the highest level of protection possible. The incontinence bed pad will only serve as additional protection should an accident occur when the person with incontinence is in bed or sitting down somewhere. Have a medical evaluation-Incontinence is always a medical condition. Anyone experiencing incontinence symptoms needs to see their doctor in order to determine what the underlying cause could be. Incontinence is never a normal part of aging and should not be treated as such. Keep in mind that many types of incontinence can be successfully treated or have the symptoms reduced. Your doctor can also be a valuable resource in how to better manage your incontinence. Have the right incontinence undergarment-Today, there are more choices then ever before when it comes to incontinence underwear. Whether the incontinence sufferer is on the go and leads an active lifestyle or has mobility problems or other medical issues there are incontinence products to meet those needs. Whether the incontinence sufferer needs incontinence underwear that can be worn under normal clothing or an adult diaper there are many different types and styles to choose from. Having the right adult incontinence product that fits can help to provide a high level of both comfort and protection.